Wing span (spanwijdte) 1885 mm 74.2"
Rotating retracts: including alloy wheels, oleo struts and latest electric retract system. Incorporate all of the latest design improvements. 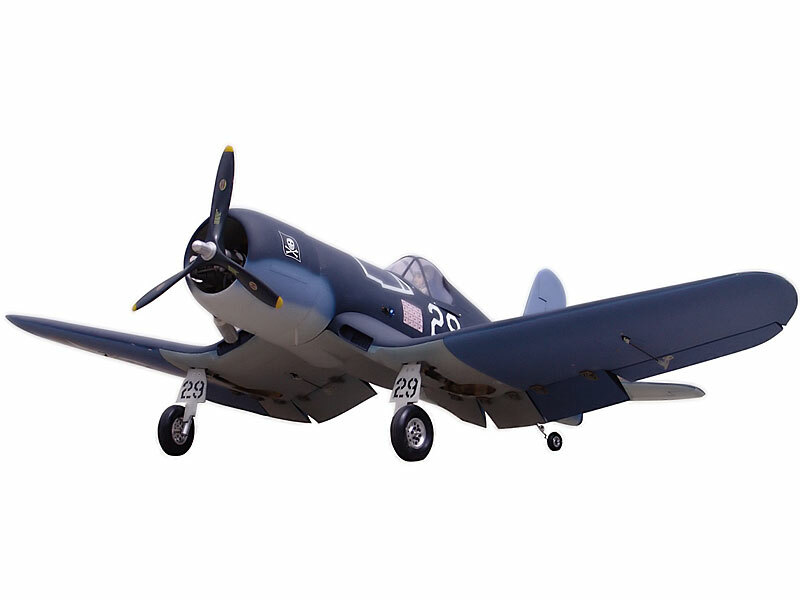 The Corsair started as a USN requirement for a carrier aircraft that could perform with the best land based aircraft of its day. It was harnessed to a 2000hp Pratt and Whitney 2800 double wasp engine, which allowed it to exceed 400mph in level flight, becoming the first US production aircraft to do so. Other carrier aircraft of its time were considerably overbuilt to withstand the repeated stresses of carrier landings. Early carrier trials produced mediocre results, and the Navy released the aircraft for the Marine Corps who desperately needed a decent replacement for the obsolete F4F Wildcats. Two navy units were supplied with the Corsair, but one later gave its aircraft to the marines and the other (VF-12) was removed from its carrier, the USS Bunker Hill, but continued to operate from land bases in the Rabaul area. The Marines were very happy with their new aircraft, and it saw combat from February 1943 on from bases in Guadalcanal and the Solomon Island chain, it became a very potent aircraft and produced its first ace by May of 1943, 2nd Lieutenant Kenneth A. Walsh, who ended the war with 21 kills. As the war progressed the F4U Corsair developed itself into a close support aircraft, providing marines with precision strikes in support of amphibious landings. The Navy also adopted several squadrons as they needed more combat aircraft to combat the increasing threat of kamikaze attacks. By the end of the war, US pilots had flown 64051 sorties and scored 2140 kills against enemy aircraft for only 189 losses; a kill ratio of over 11:1. It also ped close to 70% of the total bombs ped by fighter-bombers during the war, an important statistic to the Marines on the beaches of Okinawa or Iwo Jima. It also saw WWII service with the Royal Navy in both theatres, and with the RNZAF and other commonwealth nations. 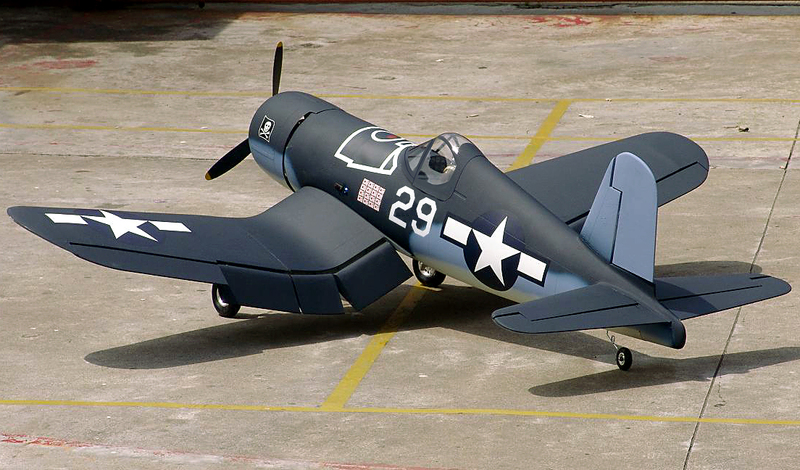 Upon the conclusion of the Second World War, the Corsair continued to see service around the world. 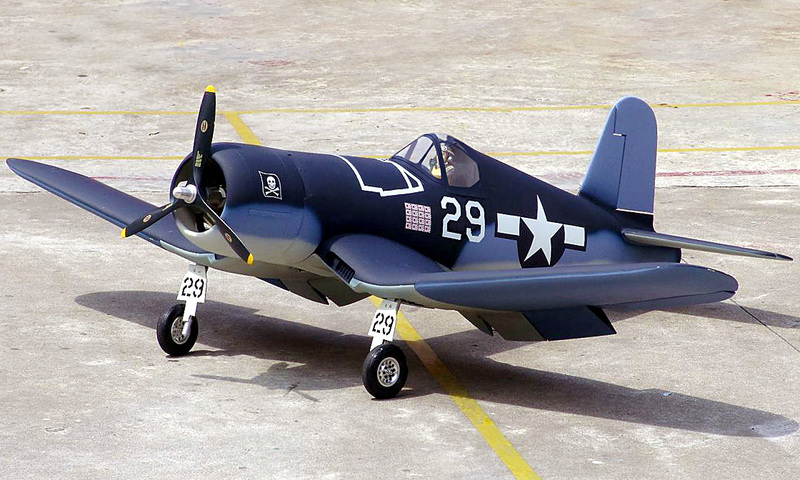 The advent of jet fighters such as the Mig-15 and F-86 Sabre made them obsolete as fighters, but the corsair continued to be a popular ground attack aircraft, and saw extensive combat in Korea. They served faithfully with the French navy during the 50's, seeing combat in French Indochina against the Vietcong, and also against the Eqyptians during the Suez crisis and continued to serve until 1964. The Corsair last saw combat in 1969, when surplus Corsairs, operated by the airforces of Honduras and El Salvador faced each other in the Football War.